My vitiligo started flaring up when I was about 15 years old. 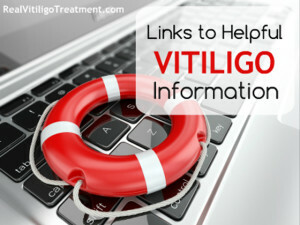 I had burnt myself with a curling iron on my forehead about a month before the vitiligo came and when the scar had healed, vitiligo formed in it’s place and started spreading to my elbows, knees, and chin. While I definitely think the burning my forehead triggered something, I don’t necessarily think it was the cause of my vitiligo. Rather, I think the burn triggered my body’s poor immune system. And I’m sure the junk food I was eating in high school and throughout college didn’t help! I’ve gone through quite a few diet changes over the years. 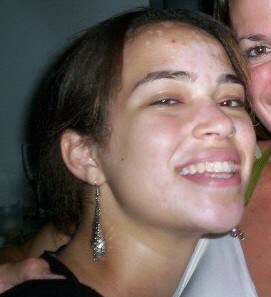 When I first had vitiligo, I ate anything and everything. No limitations on my diet whatsoever. When I got to college, I became really interested in animal rights theory and was compelled to go vegan for ethical reasons. I remained mostly vegan for four years, but was still eating garbage. Oreos are vegan! It finally started to catch up with me when I entered the workforce. I started to suffer from serious indigestion, sinus infections, and allergies. I started to see a holistic nutritionist who suggested I cut out gluten, refined sugar, process foods, and take certain supplements. 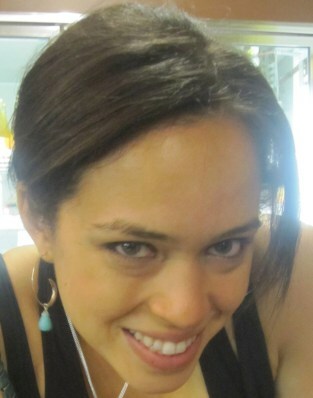 That’s when I really started to notice a difference in my health and my skin and a lot of the pigmentation returned. 4. Do you recommend supplements? If so, which ones? I’m hesitant to recommend anything because I am not a doctor, and what worked for me might not work for someone else. That being said, I personally found using L-Glutamine, NAC, and probiotics to be very helpful. 5. What topical treatments do you use to help you repigment? I don’t! I used to use topical steroids before changing my diet but nothing worked. I’ve really come to believe that vitiligo is something that needs to be cured from the inside. When I first started changing my diet, I didn’t start to see the physical changes until I changed my environment. I was working in a very high stakes environment where it was very difficult for me to get enough sleep or avoid being stressed out all the time. I quit my job and went to Canada for 10 days and felt more relaxed there than I had felt in a long time. I remember going bike riding on a warm summer day and coming back worried about how my new tan would look. Then I looked in the mirror and saw that for the first time in years, my tan was even on my forehead. So while diet is certainly important, I don’t think my body would have been able to truly heal without taking the stress out of my life. Even now, I’ll see vitiligo spots pop back up during major times of stress. Now, I make sure to fit in at least 10 minutes of meditation every day to keep it under control. I’m going to have to echo one of your other vitiligo success stories – Aine Anderson– in saying that I don’t want to endorse any dietary trend. I am however, a big fan of authors who provide insight into how our eating affects the bigger picture. Marion Nestle and Michelle Simon’s books are really great for that purpose. Worry about your health as a whole. If you have vitiligo, my guess is that it’s the least of your health problems. How’s your diet? Are you sleeping enough? Eating too much sugar/alcohol/processed food? Fix those things first and eventually deeper healing will come. In the meantime, find a good coverup and forget about it, because stressing over vitiligo can make it even worse! Hi mam for how long you took all the supplements. Hi Alana, you say fine a good cover up and forget about it! I’ve liked this ever since I read it months ago. Fortunately, at the time I didn’t have any spots or patches on my face. At 35 weeks pregnant two have appeared! Can you recommend a good cover up? 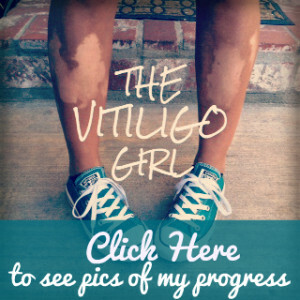 Thanks Vitiligo Girl! I love how you’re bringing us all together and forming a community! 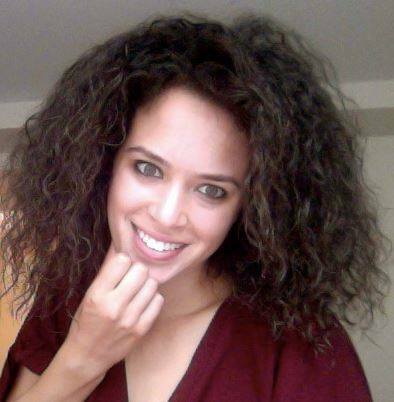 – when I first got vitiligo, it did spread rapidly for the first year and then more or less stayed stable, unless I was drinking too much or really stressed…. – it’s been over 3 years since I’ve re-pigmented. For the most part, it’s stayed the same, although a few small spots came back during law school. – I’m still mostly vegan, but I admittedly cheat every now and then. I got my first spots back in January and changed my diet in February. Then started meditation etc… In March. Some spots are becoming more prominent and maybe getting larger, but I am not sure if that is because that is what is happening or because they’ve been there and my normal skin has gotten slightly darker due to sun. Hmmm. You’re story gives me hope though, to continue what I am doing. Thanks heaps for taking the time to reply. My daughter has a spot too (which the dermatologist thinks is Vitiligo as well) which coincidentally (?) appeared in January as well. I am hoping we’ll get it all sorted. I suppose it’s not going to change over night (although it feels like those darn spots have). I like your comment about just putting on some cover up and forgetting about it until then!!! Ps so great to hear a follow up story a few years on. That it’s mostly stayed at bay for three years. One quick question, in that 12 months that you made changes, was it still spreading then or stagnant during that ‘healing’ period? Far out! I just re read your post above, you saw results within 1-2 months, not 12 months!!! That’s fabulous! I am thinking perhaps that are still a few changes I need to make or that my gut health was ‘really’ bad and is taking some time to heal. Plus, going into winter here in the Southern Hemisphere my spots aren’t receiving any sunlight anymore. My vitamin D levels are above the normal so my dermatologist wants me to hold off on light therapy until they come down. Thanks for sharing your story. How long has it been since you re pigmented? For the most part, has the pigmentation stayed? Is your diet the same? Did you have a period in that 12 months that it seemed like it was spreading?